Hello, in this post we will let you through the process of how to e file TDS return. Follow the step by step procedure. Step-1 Visit the Income Tax Department website and click on login here. Enter your login credentials. Step-3 Next, enter the Statement details and click on Validate. Step-5 Once the TDS is uploaded, a success message will be displayed on the screen. A confirmation mail is sent to your registered mail ID. Step-6 The below screen appears if DSC is not generated. Then the users have to click on “Click here to e-verify” to e-verify TDS. Step-7 The users have these three options to verify as shown below. If the user selects “Option 2- I do not have an EVC and I would like to generate EVC to e-Verify my Form” the following screen appears. Select the appropriate option from the screen. EVC – Through Bank Account Number – To generate EVC through Bank account Number you need to pre-validate the bank details. If the Principal Contact has not pre-validated the Bank Account Number, the following screen appears. EVC – Through Demat Account Number – The Demat account details of the Principal contact should be pre-validated. If you have not pre-validated the following screen appears. If the user selects “Option 3- I would like to generate Aadhaar OTP to e verify the Form”, the principal contact has to complete the Aadhaar-PAN linking process. The generated Aadhaar OTP is sent to the principal contact’s Mobile Number. Enter the Aadhaar OTP and Click on Submit. 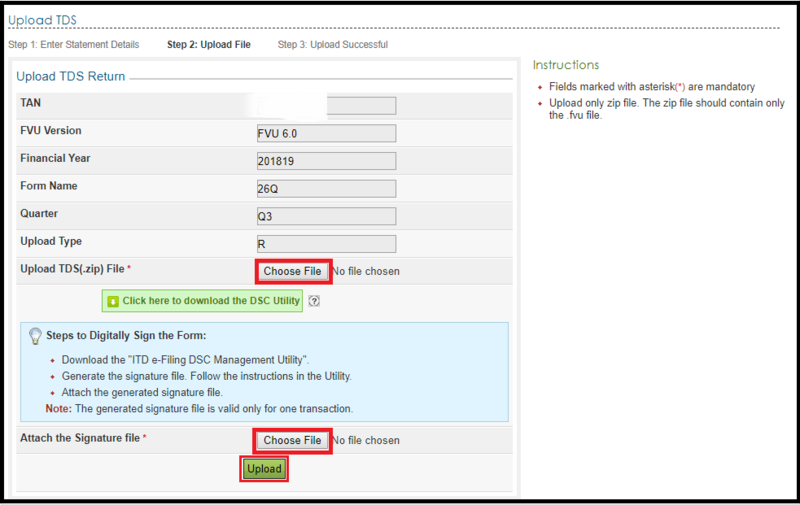 Step-8 To view the filed TDS statement Login to e-filing, Go to TDS and click on View filed TDS. Step-9 Select the details from the drop down for which TDS was uploaded. Then, click on “View Details“. Step-10 The status of the details will be displayed. Step-11 In case of “Accepted“, click on the Token Number and download the Provisional receipt as follows. Step-12 In case if “Rejected” Click on the token and view the details of the error as shown below. This lets you through the whole process of how to e file TDS return. Also, let us know your opinion by commenting below.